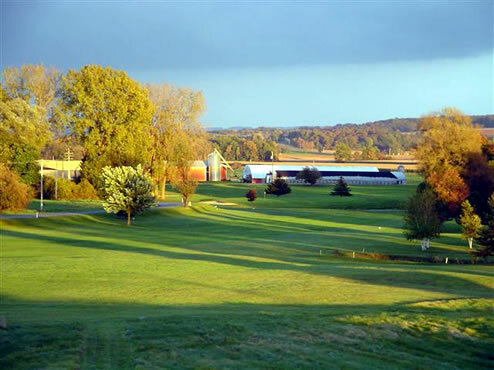 Dutch Hollow members and customers include Golfers from Auburn, Camillus, Marcellus, Manlius, Moravia, Skaneateles, and Syracuse. 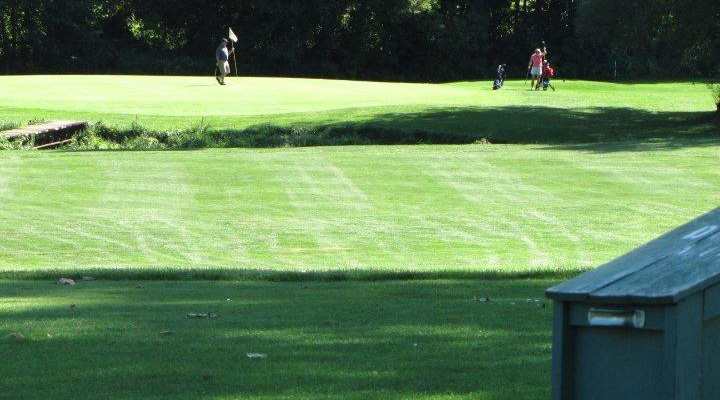 An expanded members tournament schedule has been well received featuring Captain and Crew, Best Ball, and Scotch formats. 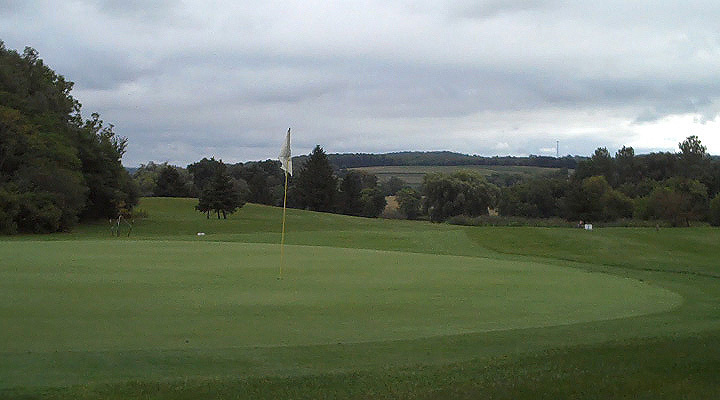 The view here is from the left of the green. 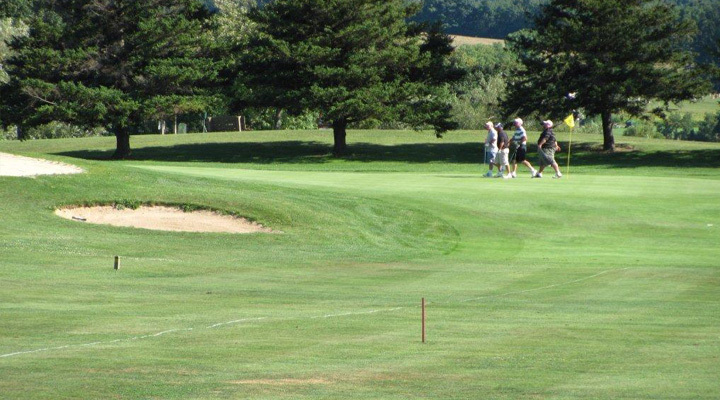 Off the tee, a long tee shot will give you a chance to go for the green in two. 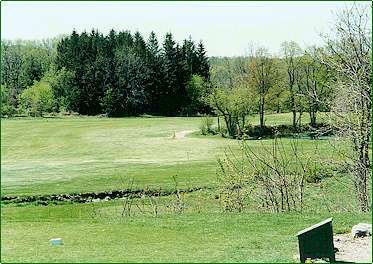 You must however avoid the pond right of the fairway in the landing area, then place an exacting second shot over a pond, (that you see in the picture,) in front of the green. 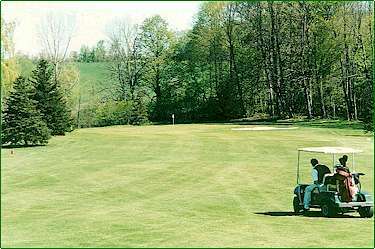 If you are too long, you are then faced with a difficult downhill chip or pitch onto a green that slopes very fast back toward the pond. 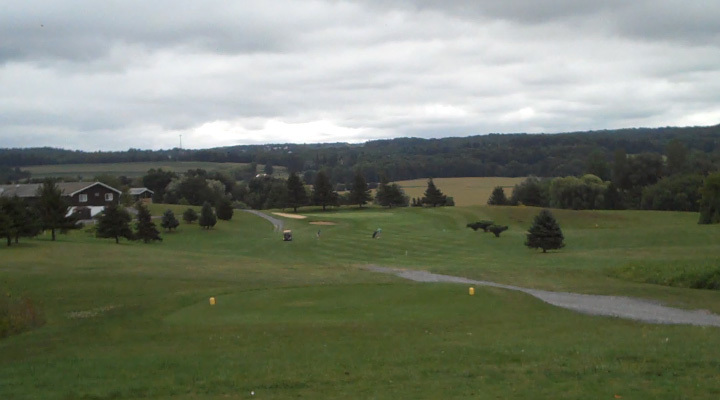 This view, from the White Tee, reveals a dogleg right. A huge pond lurks to the right of the tree line, catching any slicing or fading shot that does not have enough carry to clear the trees. 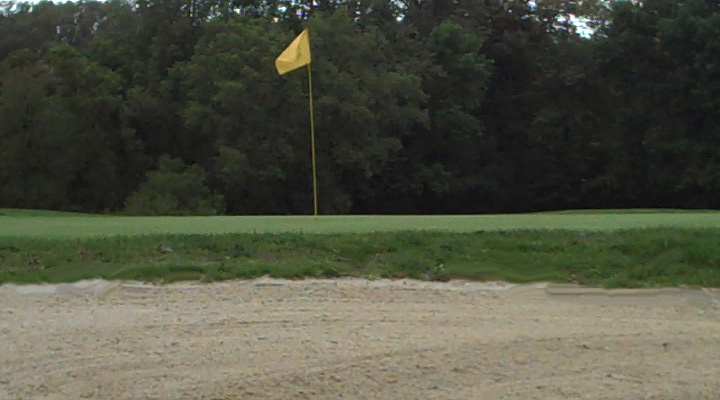 Out of bounds is on the left. 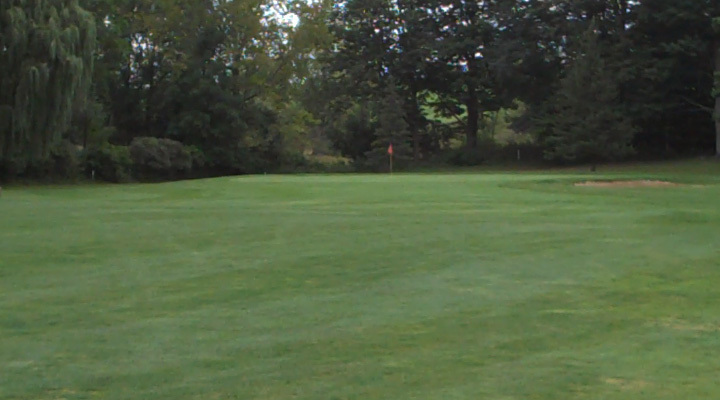 The smart shot is a drive down the middle, to a huge green that slopes from back to front. 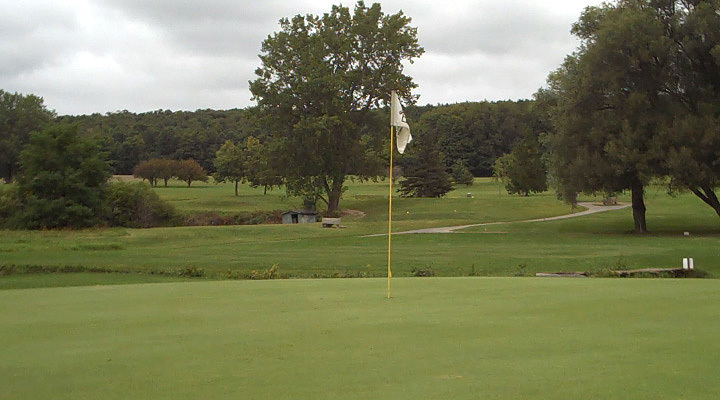 The third hole demands accuracy off the tee. 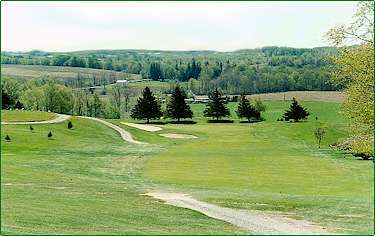 Dutch Hollow Brook crosses the entire width of the fairway at approximately 190 yards off the tee. 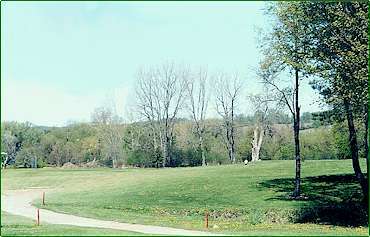 A hill and treeline to the right, and a hazard and giant willow tree to the left provide another demand for accuracy for anyone trying to "thread the needle" off the tee. 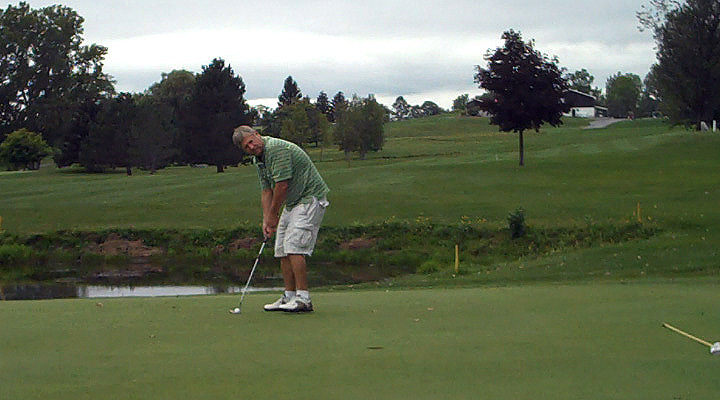 An inverted saucer shaped green again demands a skillful shot to get the ball close to the hole. 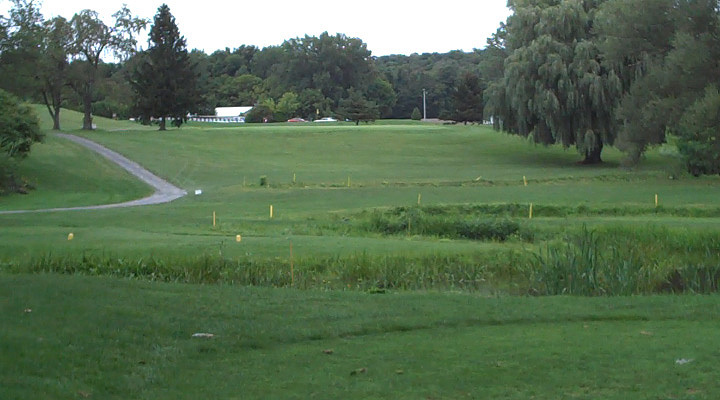 Dutch Hollow Brook guards the front of the green, with another giant willow just off to the right. 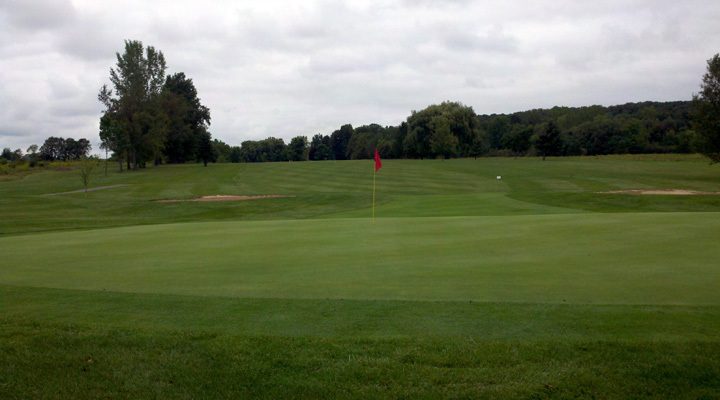 The hazard circles the green to the left. 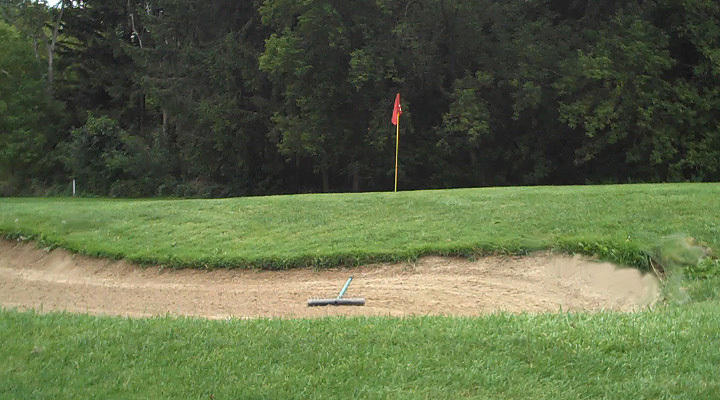 This hole demands accuracy as well as correct judgment of distance on the tee shot. 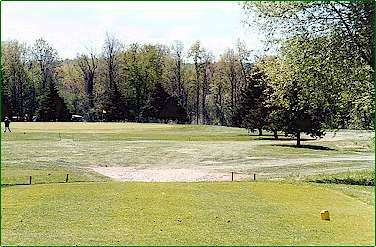 Out of bounds well behind the green can be reached if a tee shot hits the downslope. 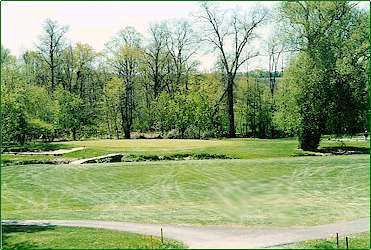 One of the best par 3s in Central New York, a par on #4 is a proud accomplishment. 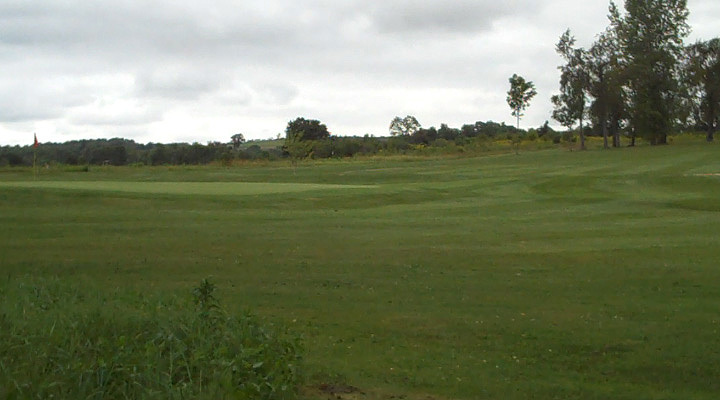 The view here is from the landing area about 250 yards off the White Tee, and 175 yards from the green. A high ball hitter can get the ball over the trees, and have a chance for eagle. 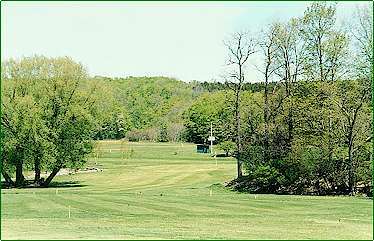 A shot hit a little thin or too low will find the trees and hazard to the left; and a layup that goes too far right will present a third shot that will be blocked by the trees. 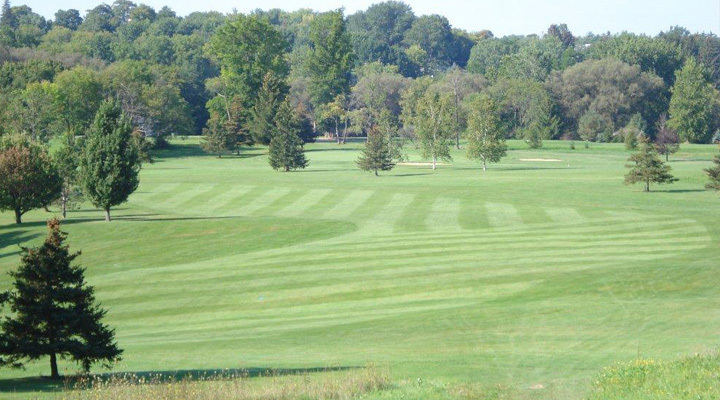 One of the many "ultimate risk and reward" shots that you will find at Dutch Hollow, hole #5 is a short par 5, but your score can easily be double that if your shots are not accurate. 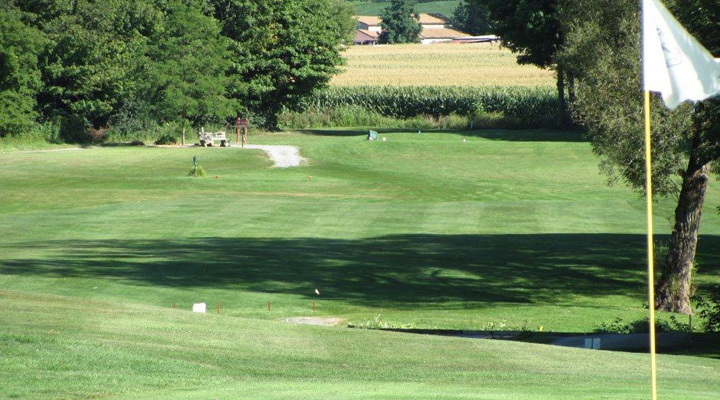 A long par three of over 200 yards from the back tee, your tee shot must negotiate trees both right and left of a narrow passageway that forms a chute to the green. 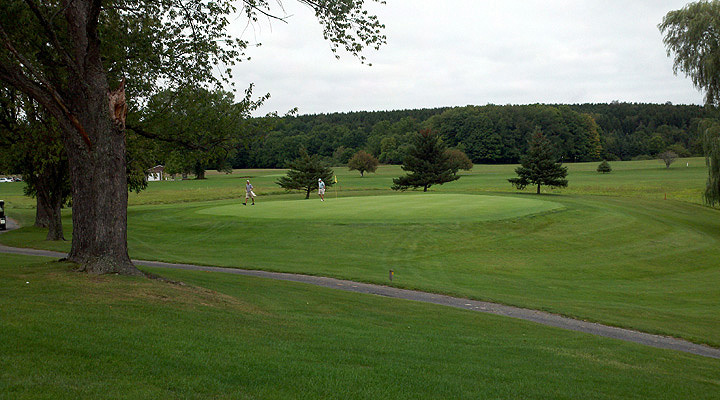 Your shot must carry the full yardage to the green, which is elevated and slopes from back to front. 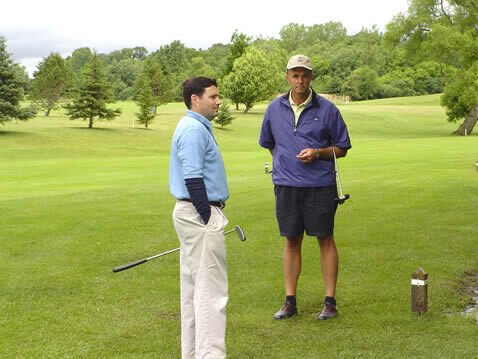 A push or a hook is likely to hit the branches that overhang the opening through the middle in front of the tee. 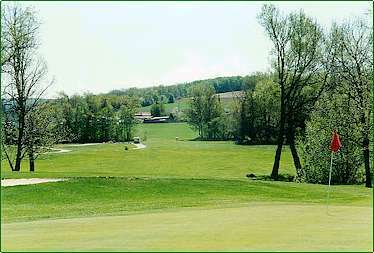 Hole #6 is one of the long par 3s at Dutch Hollow. 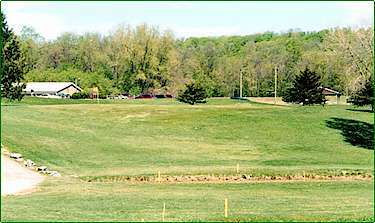 This view from the green looking back toward the tee gives a look at one of the Dutch Hollow "signature holes. 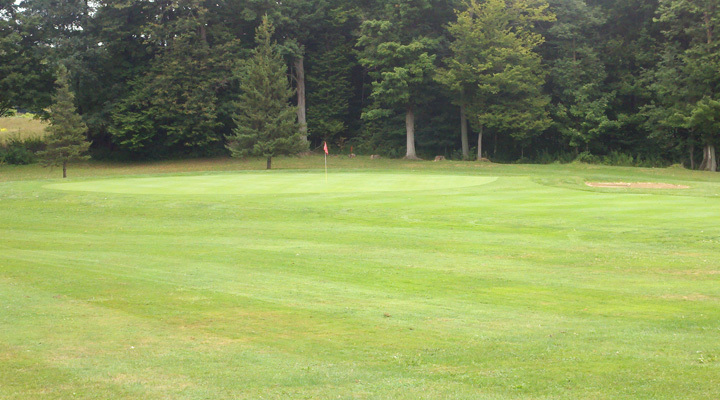 Your tee shot must be placed in the opening between the trees. 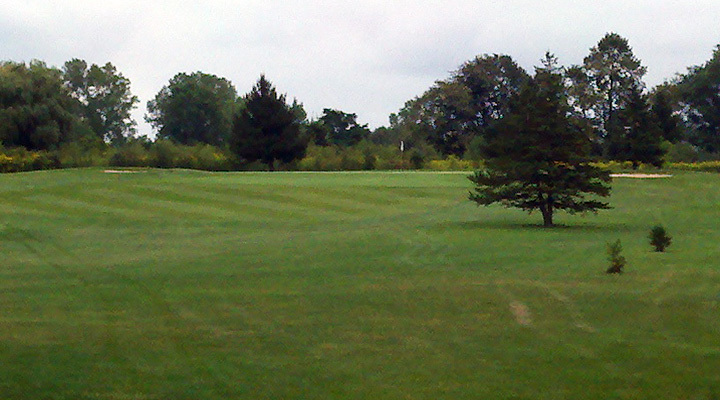 From the tee, if you go too far right you are faced with a difficult shot over the trees that get higher every year. 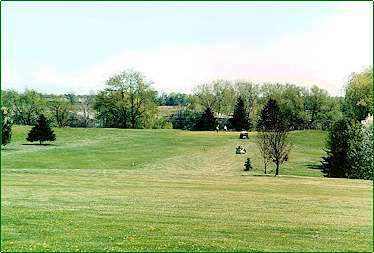 Go too far left and you must play a hooking shot around the trees to a green that again slopes from back to front and toward the left. 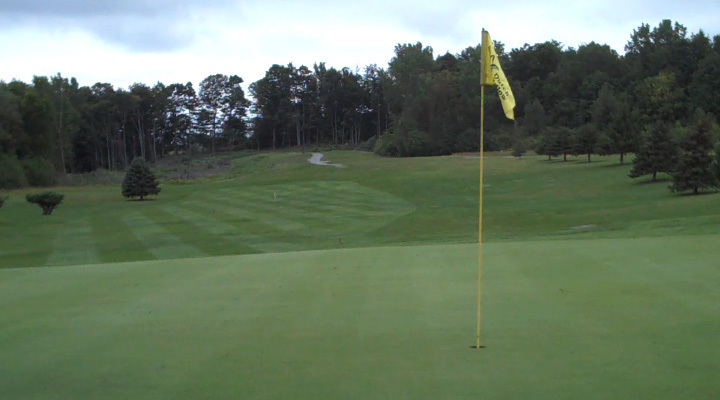 If you miss the green, your chip shot requires imagination and a delicate touch to get the ball close to the hole. 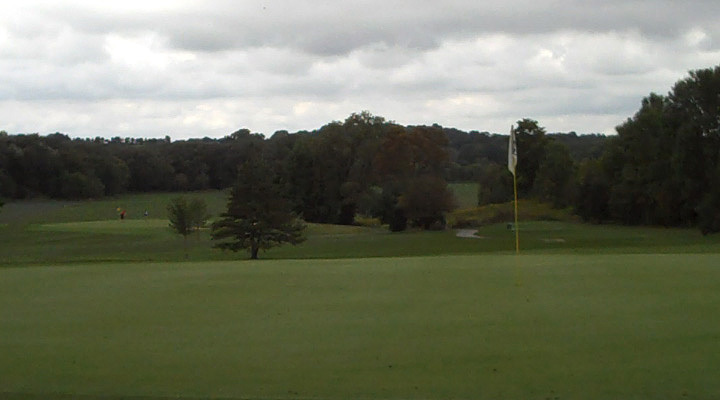 This view is from the rough way left, and shows the green off in the distance above the dogleg. 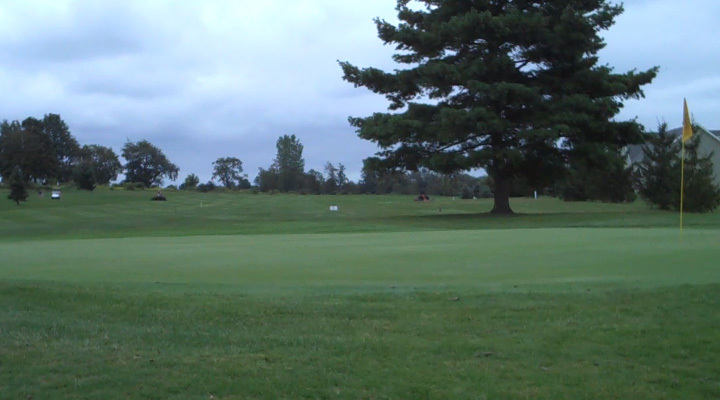 The fairway is rolling, and a shot too far offline to the right will find the in-course out of bounds. High grass left often gives no other option but the stroke and distance penalty. 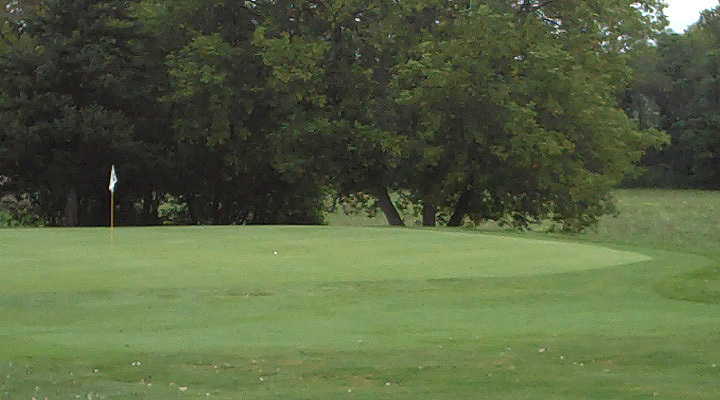 Hole #8 is reachable in two with two well struck Golf shots. 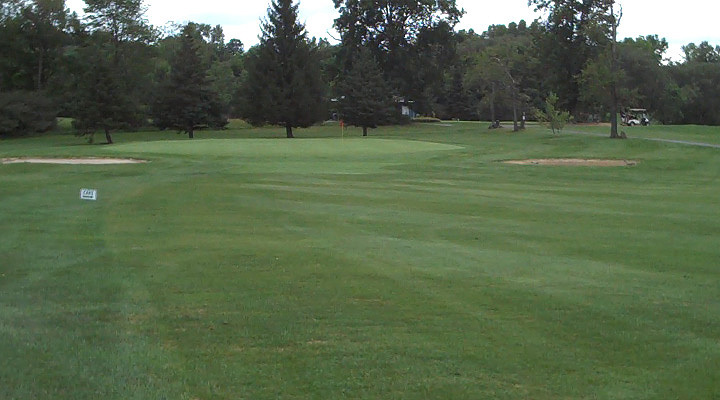 But missing the green on either side, or to the rear will leave a very difficult pitch or chip to a slanted green. Pick your shots well here,or par will be hard to make. 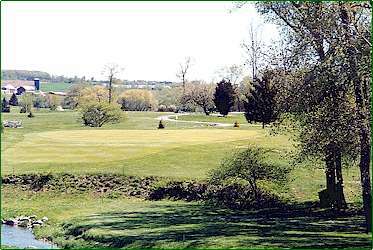 This medium length up-hill par 3 usually plays against the prevailing winds. 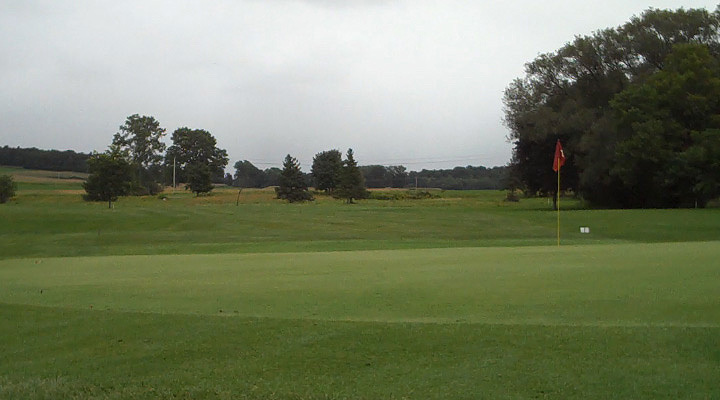 Depending on the winds, you can use any club from a 3 or 4 iron, to a 7, 8, or 9 iron. 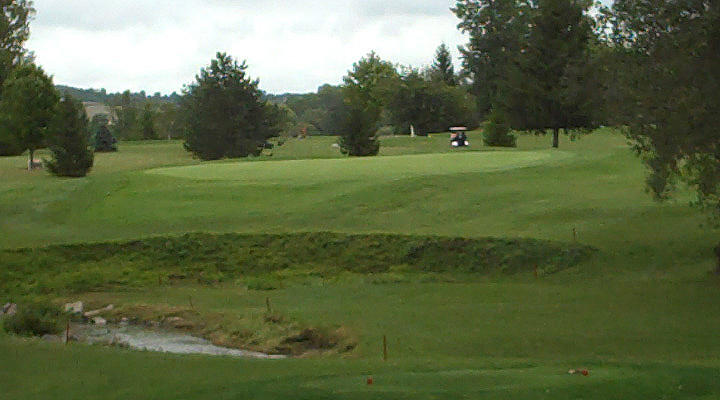 There is not much room to miss the green short or to the right, as any wayward shot will roll down a severely sloping bank. 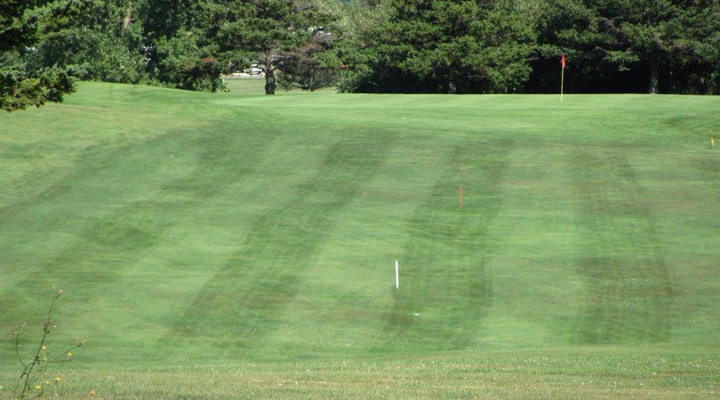 If your tee shot is too long, you will be chipping from rough to a fast downhill green. 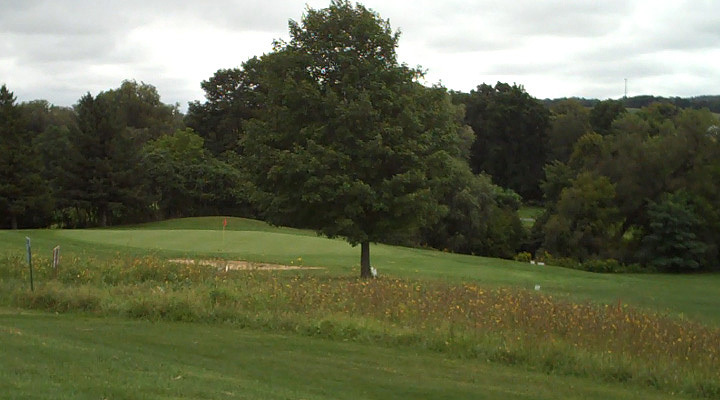 A shot missed to the left often finds itself under a well placed, mature evergreen. 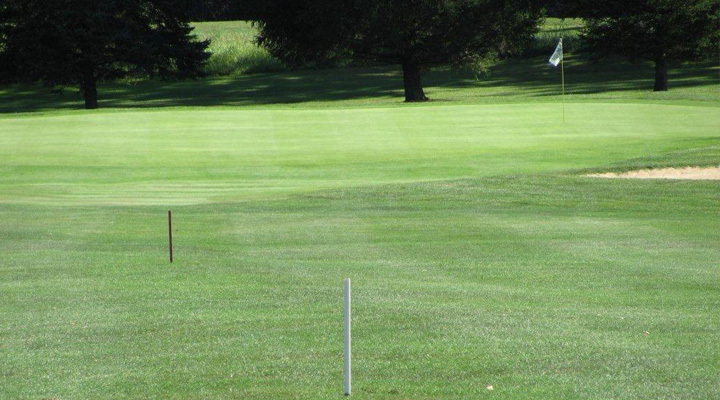 Accuracy and distance are key at #9. A par here is well earned. 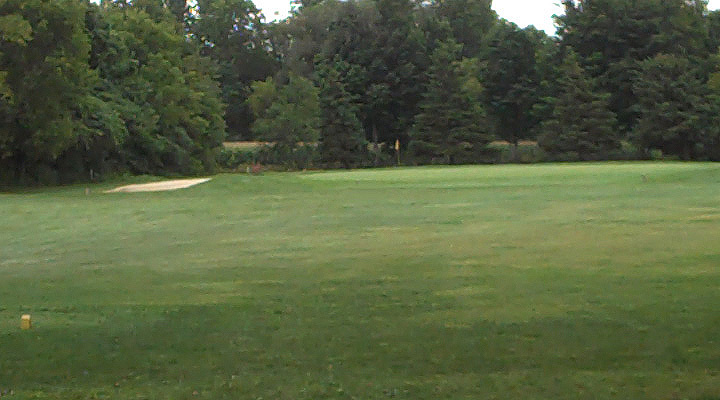 The ideal tee shot is a slight fade hit just to the left of the evergreen trees in the center of the picture. 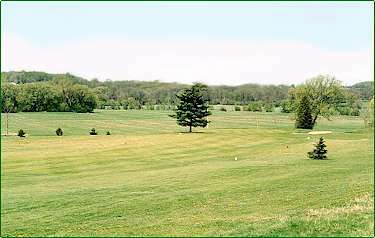 The fairway presents a dogleg right, with a hazard along the right tree line. 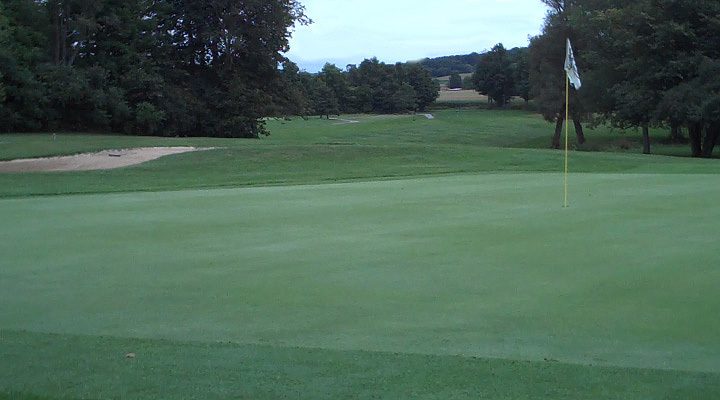 If you pull your shot left, the approach to a smallish green will be longer than you want. 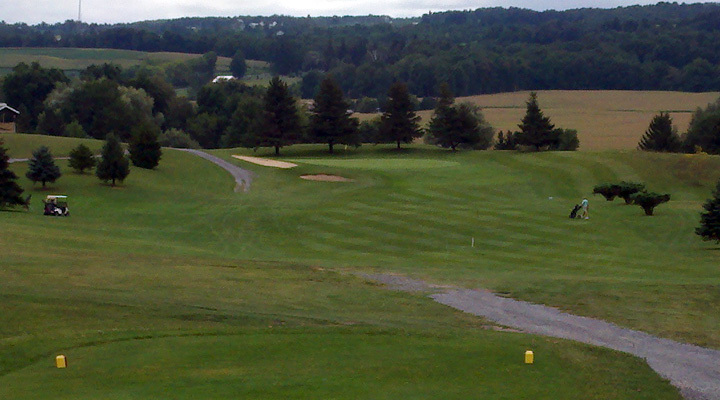 A good drive as described above will usually leave you with a short iron or wedge to the hole. 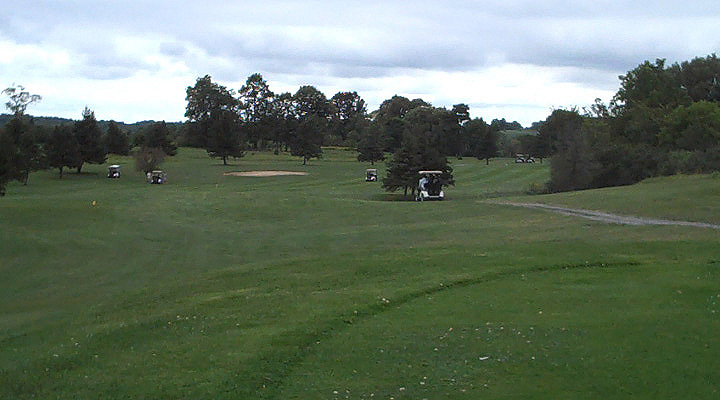 This picture gives you a good view of what lies ahead, though you wont see this view from the tee. 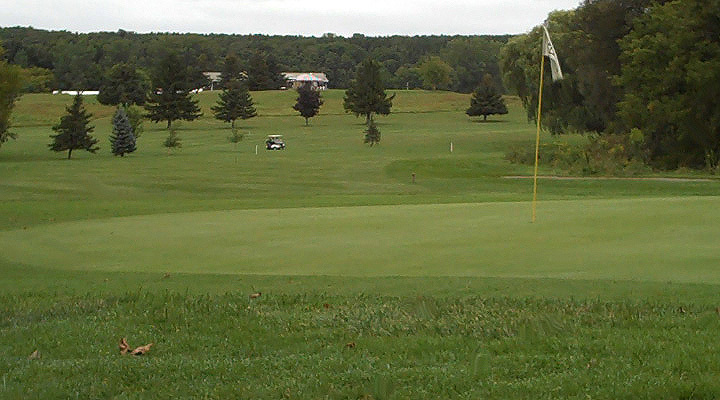 What you see here is the view of the green from the top of the landing area. 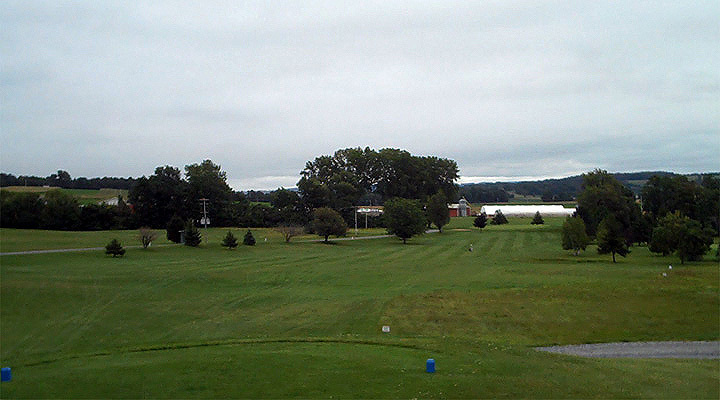 The tee shot is straight out to a generous fairway. 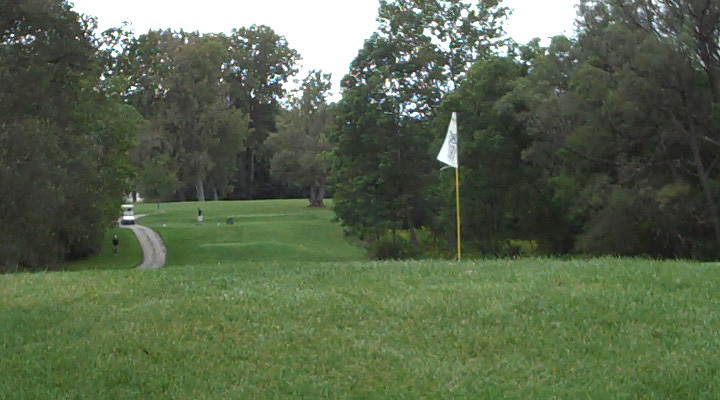 If you can get it out there far enough, your drive will hit the downslope and give you some extra yards. 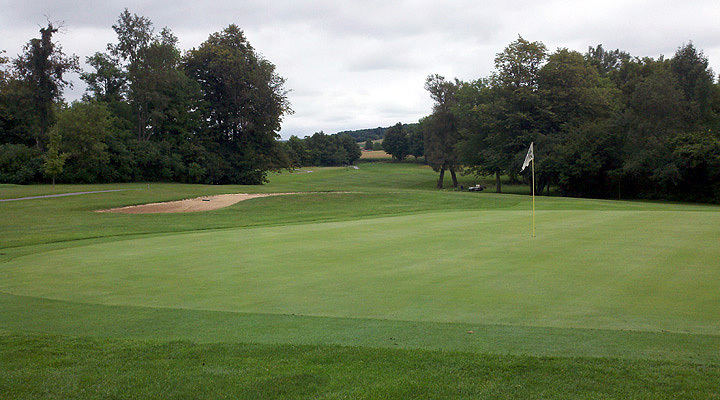 The approach is to a difficult green, with a tough recovery for any shot that goes long, left, or right. 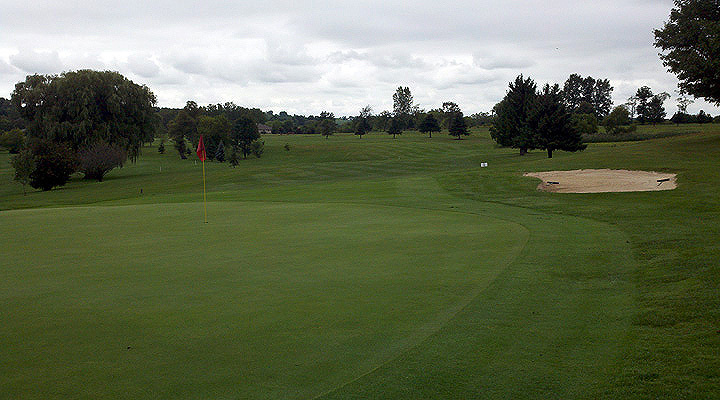 Another of Dutch Hollows signature holes, #12 is close to the ultimate "risk and reward" hole. The view here is from behind the landing area. 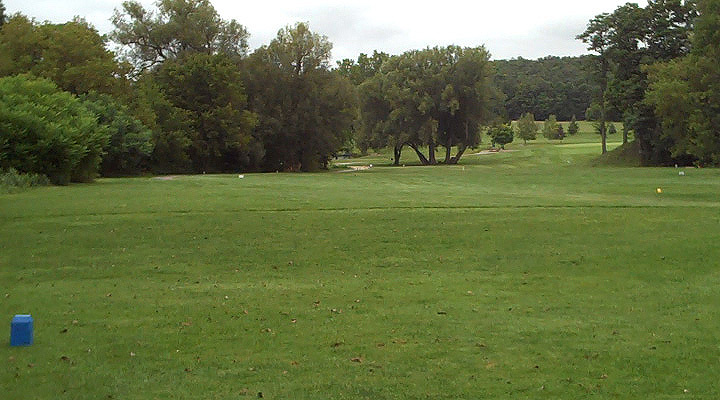 From the tee, the player has the option of hitting a high drive over the trees. 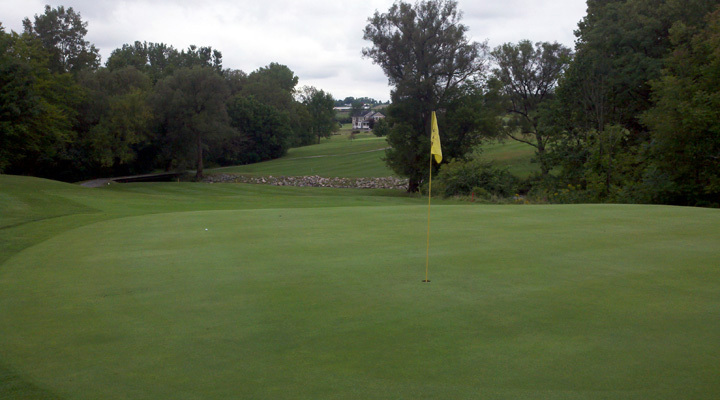 This shot must carry 260-270 yards, to land up in front of the green. 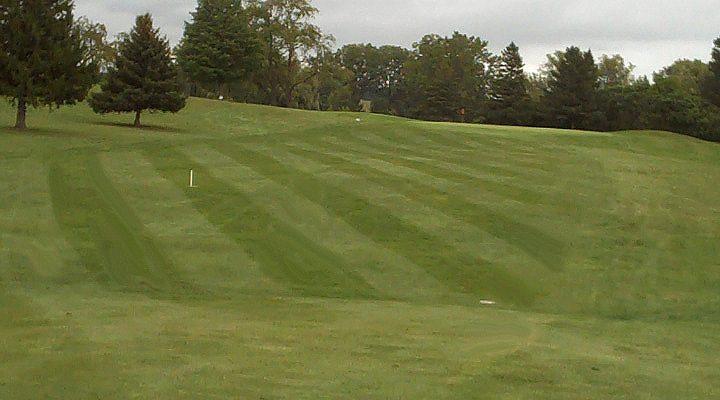 The smart play is a mid iron over the hill that you will see from the tee. 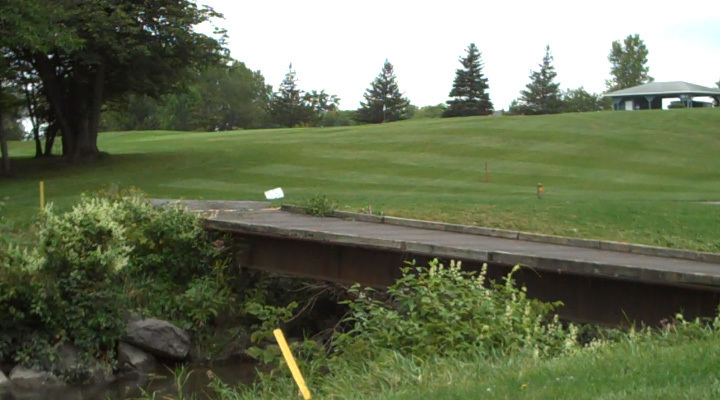 Aim at the bridge, and the ball will roll down into the flat, leaving a mid to short iron to a green that slopes from back to front and toward the creek on the left. 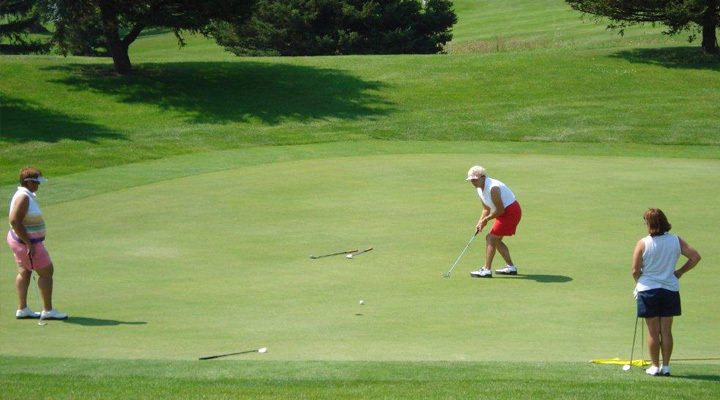 Once on the green, a delicate putting touch is required to get the ball in two putt range. Birdie here is a real accomplishment. 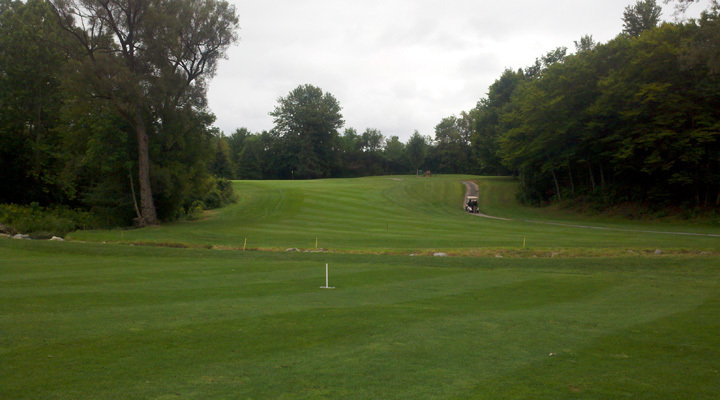 A strong dogleg right, this hole requires a power fade off the tee. 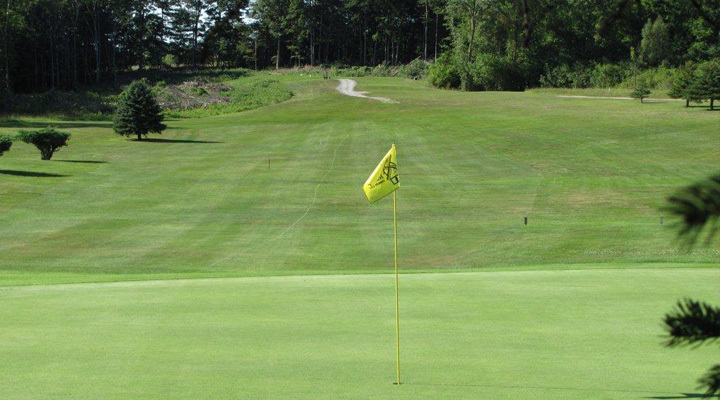 A tee shot that hooks or goes left will leave a very long second shot to a smallish green with out-of-bounds behind and to the right of the green. 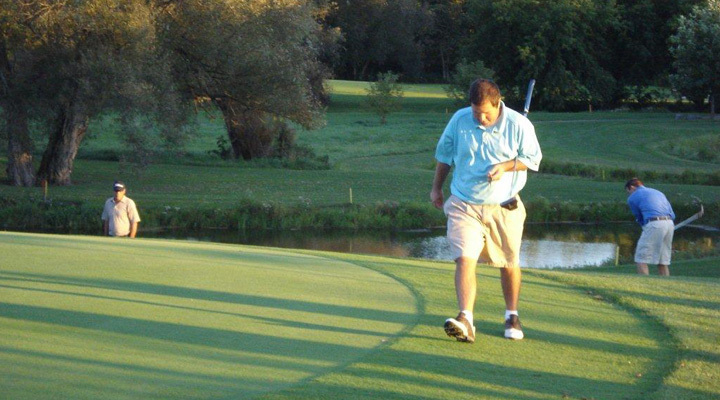 A pushed second shot leaves you with stroke and distance or a very tough recovery. 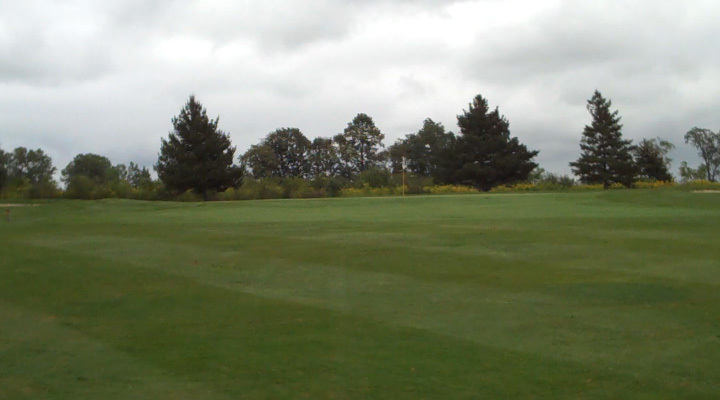 Hitting this green in regulation requires accuracy and distance control. 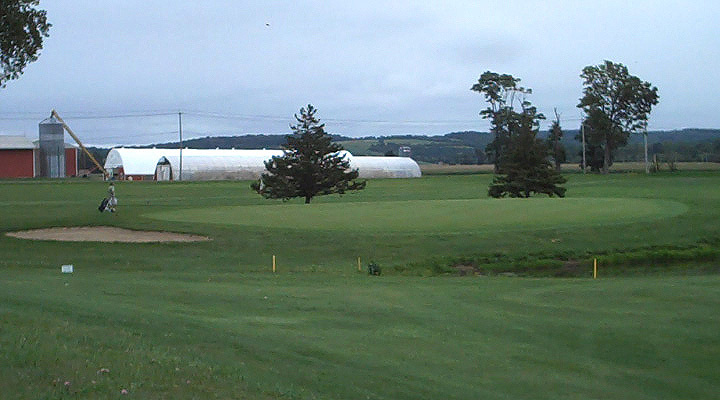 This picture shows the hole from behind the Blue Tees. 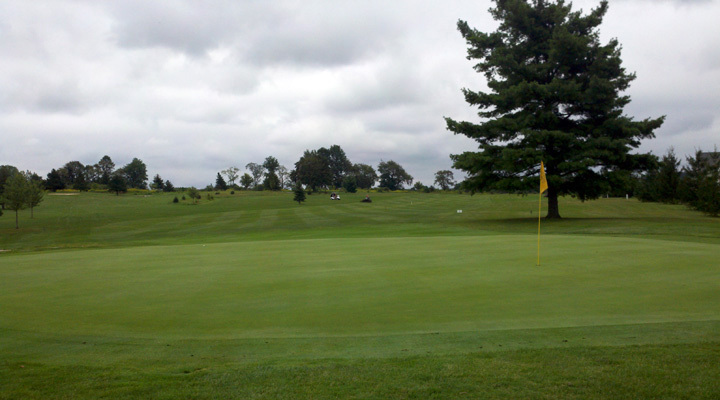 A shot of 165-170 yards is required to get to the center of the green. 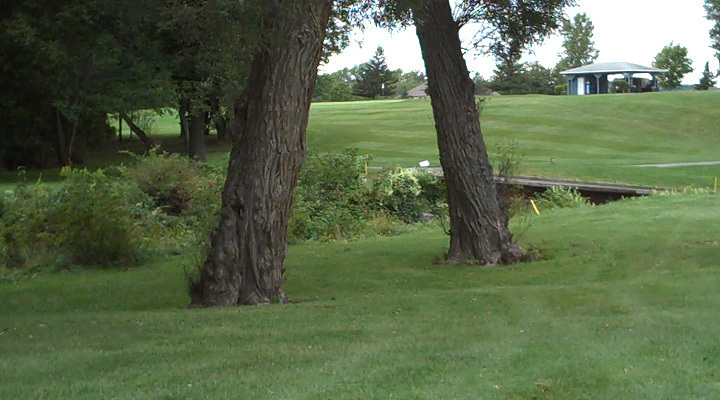 You must hit your tee shot solid, as trees lurk on the right or left, and a hazard in the front. 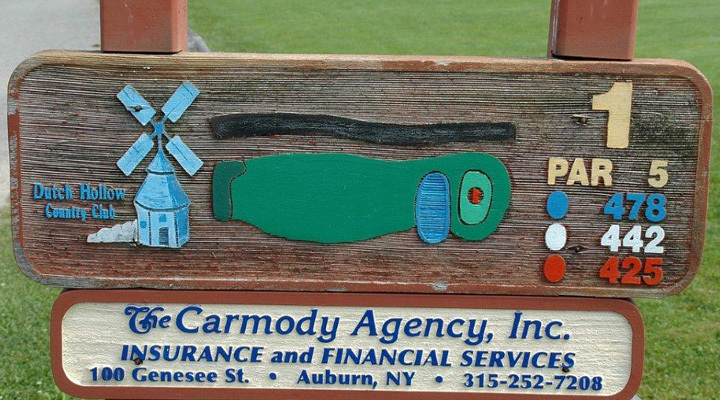 If you miss the green, recovery is difficult. 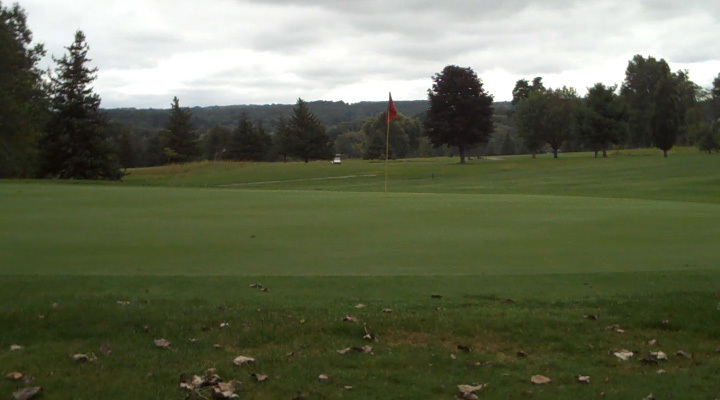 The green here is sloped heavily from back to front. 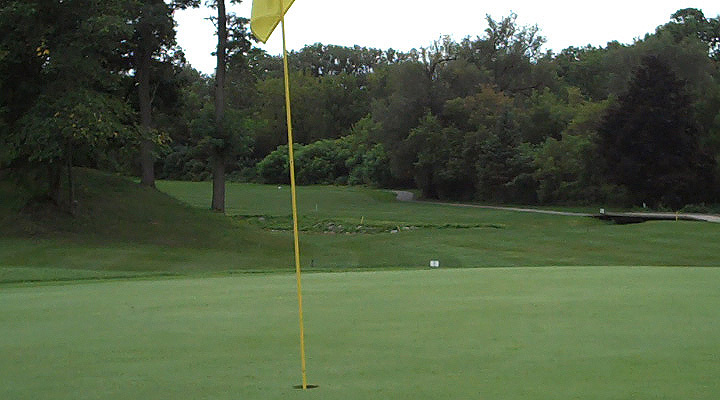 If you go over the green, your chip shot back to the hole must be played with delicate hands. A solid par 3. 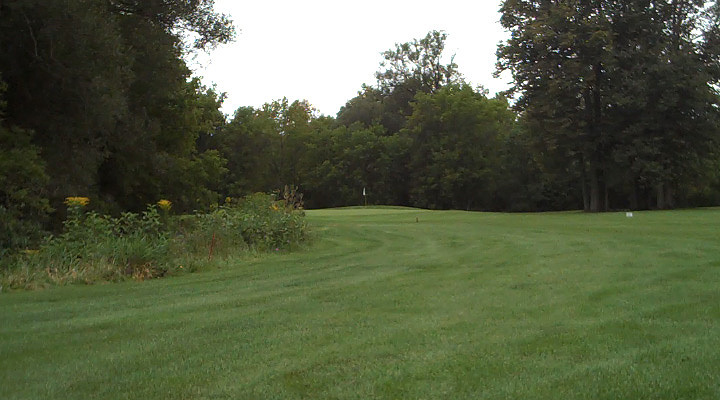 The longest of the par 5s, #15 is a dogleg left, with a split fairway to accept the tee shot. 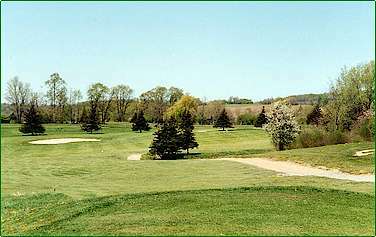 You must carry at least 260 yards to get to the pine trees in the middle of the split fairway. 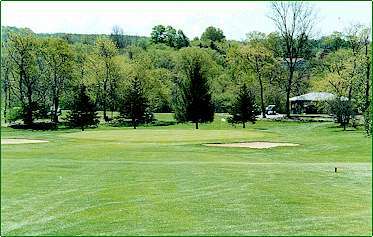 Depending on the wind conditions, you can reach the green in two with two monster shots, or you can hit driver , 3-wood, long iron. 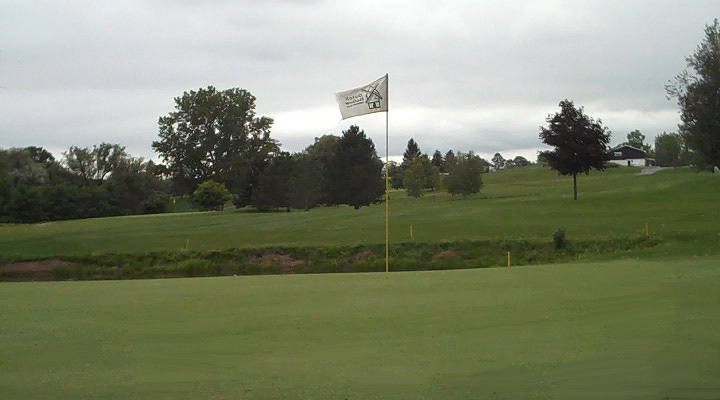 The wind is always blowing on #15, lending to the diverse character of this 1st handicap hole. 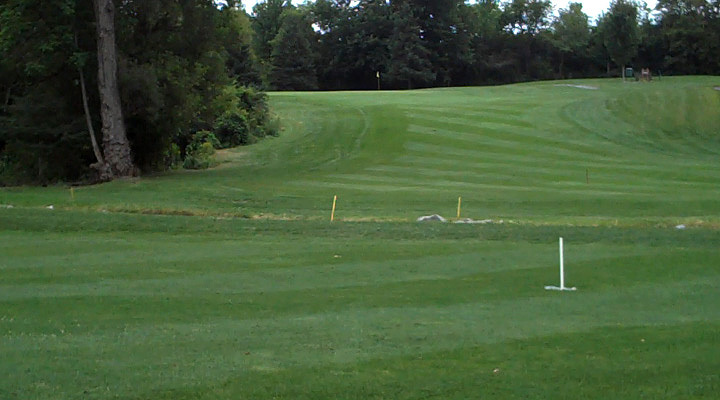 Beware that a hooked tee shot or iron along the way will get leave you out-of-bounds on the left. The green is fast from back to front. 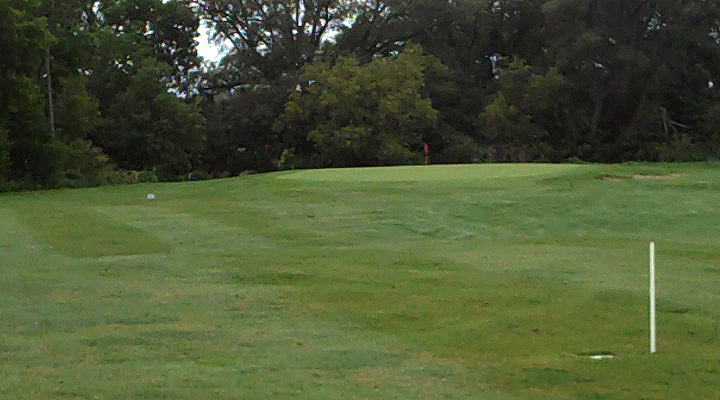 Another of Dutch Hollows long par 3s, this uphill hole plays longer than the yardage indicates. Use more club than you think you need. 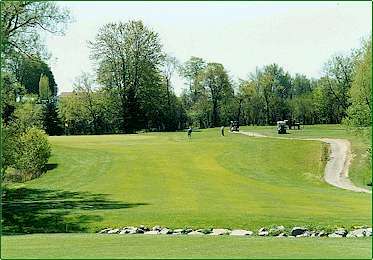 If your tee shot is short, you will either be chipping, or playing from either of two bunkers on the sides of the green. 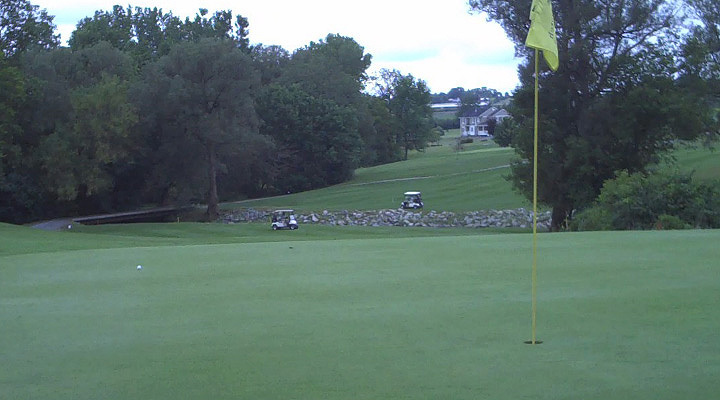 #16 is a long, difficult, straight forward par three. A dogleg left, #17 requires a draw off the tee. 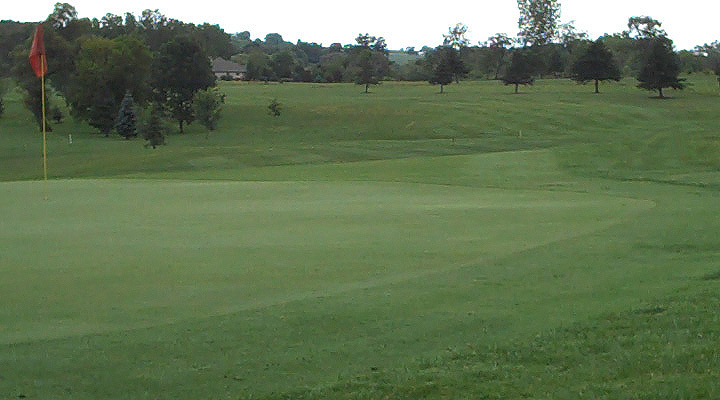 The picture shows the green from past the dogleg. If you drive it right, you are faced with a long approach over a bunker to a green that slopes from back to front and from right to left. 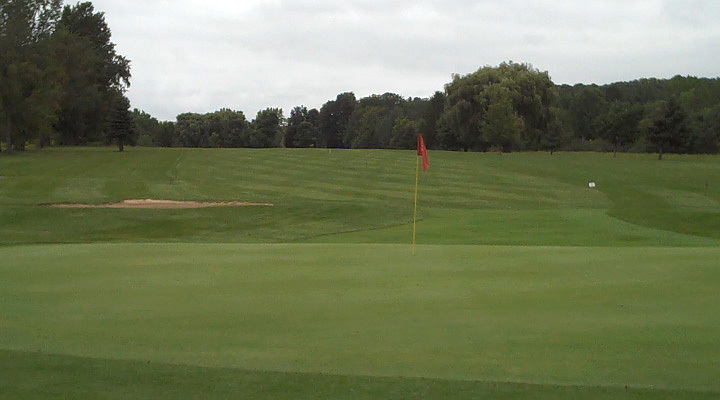 The best angle to get to the pin is from the left side of the fairway. 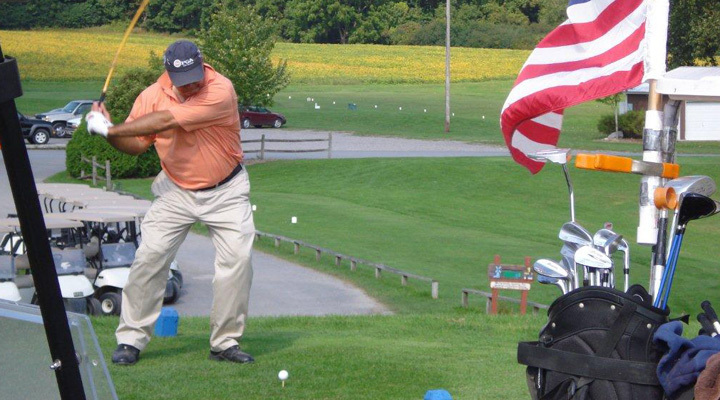 Getting there requires a skillful tee shot. 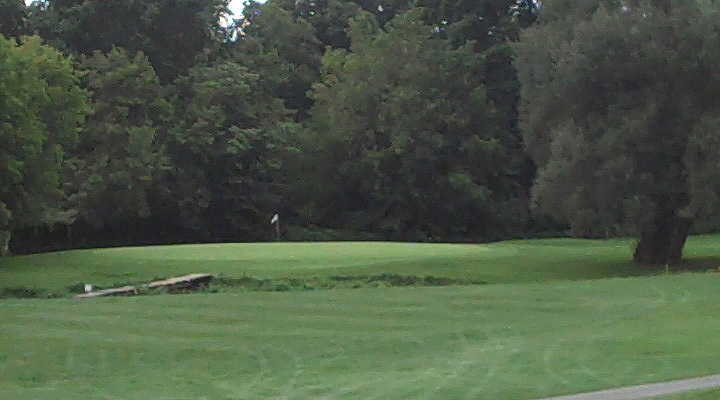 This finishing hole is a straight away par 4. 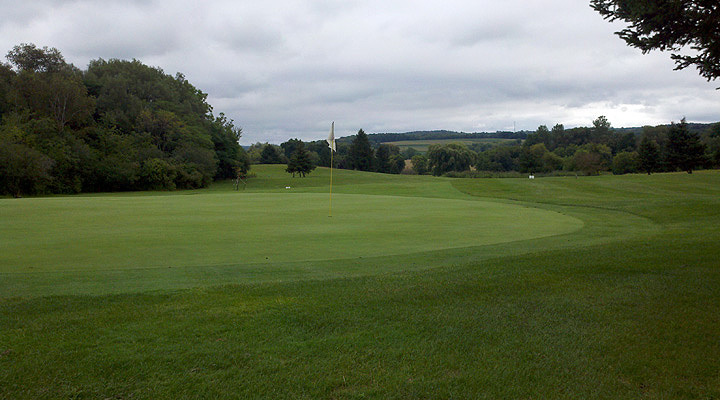 The best angle to the green is from the right of the fairway. 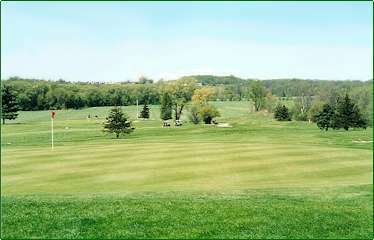 A drive left will find the rough, giving a tough short iron over a pair of bunkers to a smallish green. 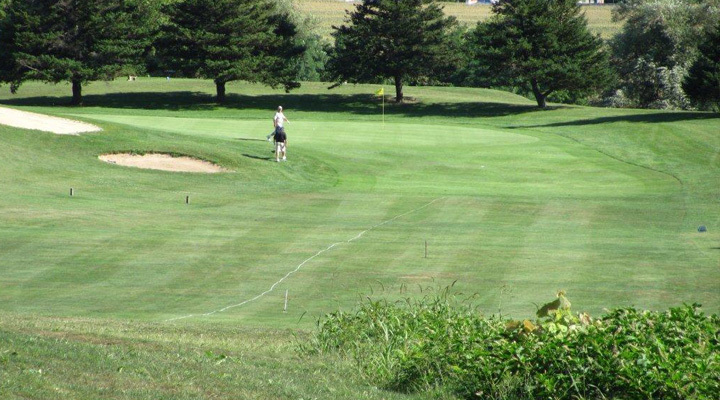 A hooked tee shot may put you out of bounds. 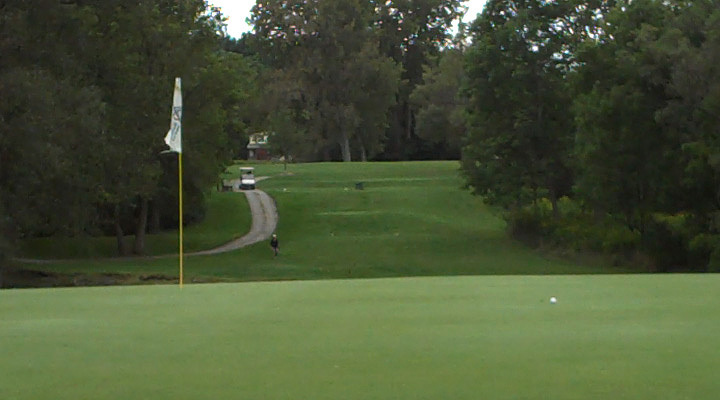 If you can play a bump and run shot from the right of the rairway, you can get the ball close. A high iron will also land softly. 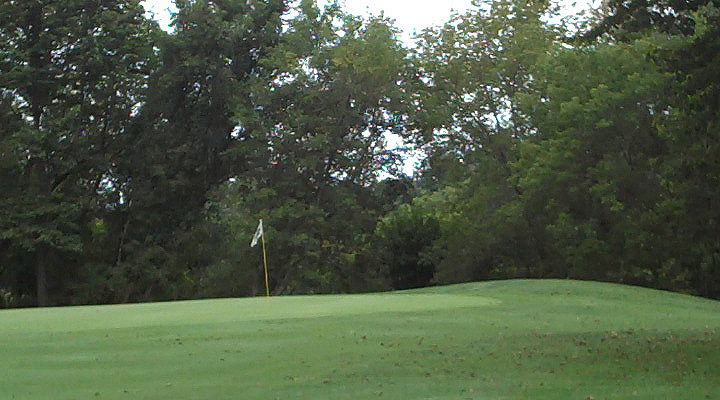 #18 is a difficult to read green with many subtle variations in the way the putt will roll. Do not be fooled by the short length of the hole. You must play well here to finish well.